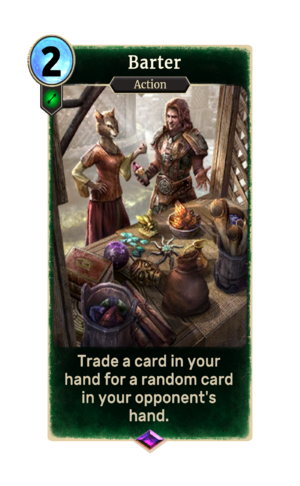 Trade a card in your hand for a random card in your opponent's hand. Barter is an epic Agility action card. It is part of the Heroes of Skyrim expansion. This likely depicts the Riften Grand Plaza. Some interesting objects to note is the daedric artifact Azura's Star, a dragon priest mask, a stralhiem sword, glass daggers, a bowl of briarhearts, tomes of conjuration, and a skooma bottle in the adventurer's hand. This page was last modified on 23 February 2019, at 05:04.